We start with some sad new tonight. 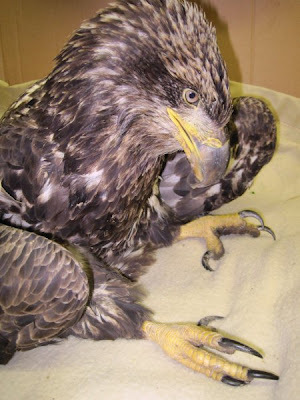 Our lead-poisoned Bald Eagle lost her fight for life early this morning. Further testing will be done to determine if aspergillosis had developed before she was admitted on Sunday. It is hard to lose such a beautiful bird. It is doubly hard to lose her to something that is totally human-caused and preventable. who have called and emailed hoping for her recovery.